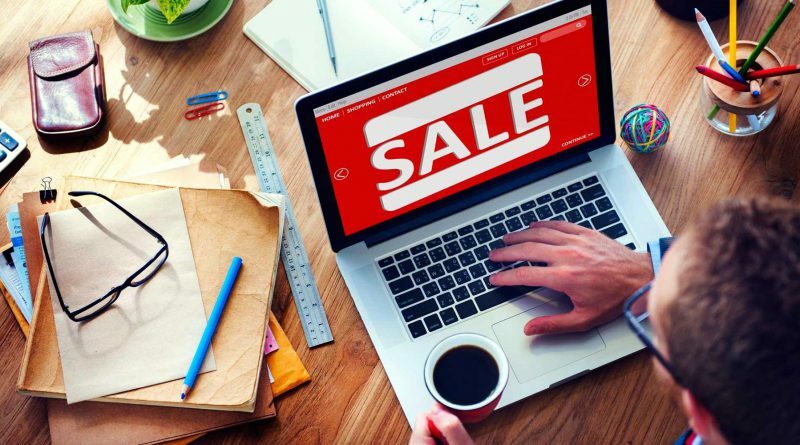 In this new blog post, we are listing all sales happening in October 2018 that you don’t want to miss! 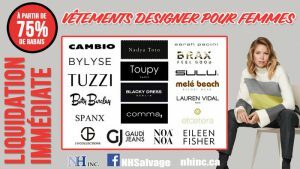 Including: Céline, Givenchy, Chloé, Tom Ford, Montval, Parajumpers, Mackage, Rudsak, NH Inc, Oxygen, Soia & Kyo, Pajar, Arctic North and many more! 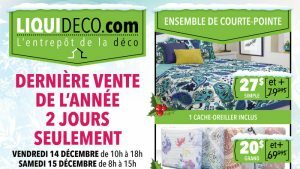 Euro Design Canada big sale open to public offering European products. Beer and wine glasses, tableware, accessories, decor items up to 75% off. 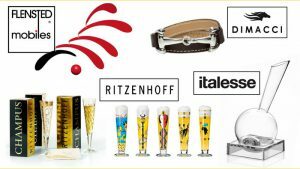 Ritzenhoff, Dimacci, Flensted mobiles, Italesse, Koziol, Koala. Join us at our Designer Warehouse Sale on December 7-8-9 to save up to 80% on authentic handbags, eyewear and shoes from luxury brands sach as Céline, Givenchy, Chloé, Tom Ford, Prada, Ray Ban and many more! Mega women’s fashion sale you don’t want to miss! On December 6-7-8 and 13-14-15 : Dalia, Renuar and Katherine Barclay. Everything at $10: sweaters, dresses, pants, skirts & jackets. Manufacturer sale, 2 days only on December 14th & 15th, 2018! Up to 80% off curtains, comforter sets, pillow covers, mattress covers, assorted bed sheets, assorted cushions, kitchen & bathroom accessories+ we pay the taxes! 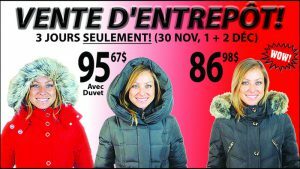 Winter Parka Sample Sale, December 3-6 in Thornhill! Up to 80% off on men’s & women’s clothing! 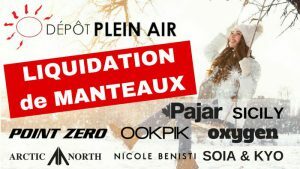 Brands: Parajumpers, Canada Goose, Mackage, Rudsak, UGG, Save the Duck, Lacoste, Diesel, Vegan Jackets, Fred Perry, Hugo Boss, Soïa & Kyo, Wildfox & more. Big liquidation sale of toys, Christmas decorations and winter coats at Boom Liquidation! Discounts of 40% to 70% on a large selection of toys. Surplus inventory stock, open or damaged boxes. Come see us! 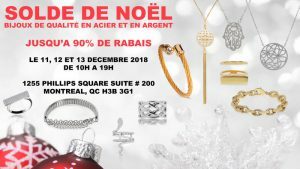 Mega Steel and Sterling Silver Jewelry Sale on December 11-12-13, 2018! Save up to 90% off retail on steel and sterling silver jewellery with crystals and many more! Blush is inviting you to their warehouse sale on December 6-7-8, 2018! Get up to 85% off on lingerie & loungewear! Save $10 on purchases of $100 or more! 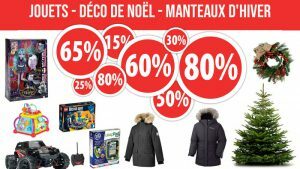 Mega sale at Centre du Manteau – 3 days only – December 7-8-9, 2018! Selected women’s coats at $86.98, down and duvet coats at $95.67. Wide selection of more than 10,000 ladies coats at the best price! Plus-size coats available. Last weekend! Ricardo B.H. warehouse sale, December 6 to 9, 2018. 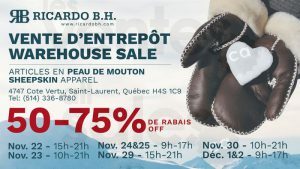 Take advantage of discounts of 50-75% off on sheepskin apparel : gloves, mittens, slippers, hats, jackets. 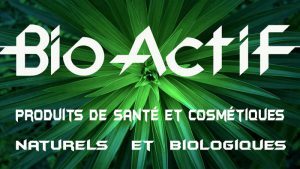 Bio-actif invites you to its warehouse from Monday to Friday inclusively from 8:30 to 14:00. Get all our natural health products and cosmetics at 2 for 1 taxes included. Down coats with genuine fur starting at 159$. Best choice of brands Soia & Kyo, Pajar, Arctic North, Ookpik, Columbia, Point Zero, CanaV, Oxygen, Diamond Trail, Nuage, Noize, Liquid, Ellabee, Oli, Rockwater Design, Misty Mountain. 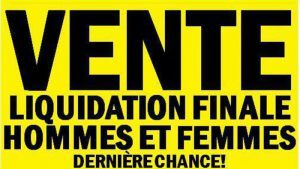 Immediate liquidation sale at NH Inc.! 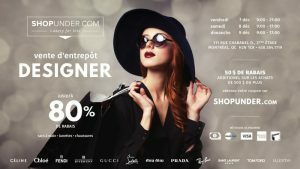 Women’s designer clothing starting at 75% off! Prestigious brands such as Nadya Toto, Bylyse, Comma, Cambio, Tuzzi, Betty Barclay, JS Collections, Gaudi Jeans, Sarah Pancini, Eileen Fisher & many others. Last chance! 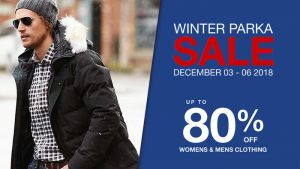 Men & women’s fashion liquidation sale, December 8th & 9th, 2018! Shirts & blouses from $5 – dresses, hoodies, jeans & shoes from $10*. Limited quantities: The North Face, Helly Hansen, Rossignol, Herschel, Burton at 80% off! GAIAM yoga wear liquidation sale at NH Inc. Save 60% to 75% off! Sizes XS to 3X. Hurry for best selection! Gamin Gamine offers a unique selection of kids clothing. Quebec & European collections such as B.Nosy, Boboli, Desigual, Mayoral, Nanö and TucTuc. Take advantage of free shipping on any order of $100 or more before taxes! Hurry! Come visit Splendid Chocolates, until December 22. 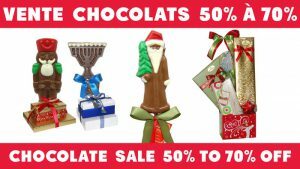 Buy quality chocolates directly from the factory from 50-70% off! We offer Christmas gift baskets, chocolate pops, chocolate bars, chocolate bark and more. All at a great price. Sales of Imported clothing for women from Europe. Do not miss out on our warehouse sale, 3 days only, December 6-7-8, 2018! Enjoy up to 80% off a wide selection of high quality ready-to-wear! 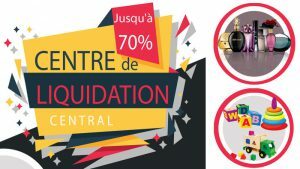 Special sale at Centre de Liquidation Central, December 8 to 20! Save up to 70% off a wide selection of brand name merchandise: winter coats, Sorel boots, L’Oréal skincare, haircare & makeup, perfumes, toys, bedding, tools and much more!